I seem to be going through a beet phase lately and always have beets on hand in my refrigerator. One of my favorite raw juices used beets, carrots, apples, ginger and lemon, and if I do not drink it daily I find I am craving it. 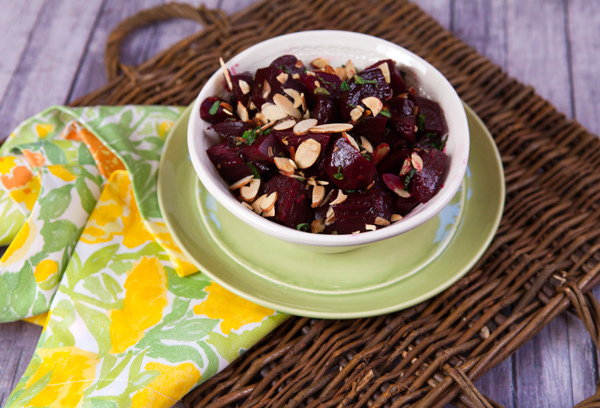 Another favorite way we enjoy beets is roasted or braised and served as a vegetable side dish, or diced on top of salad greens. 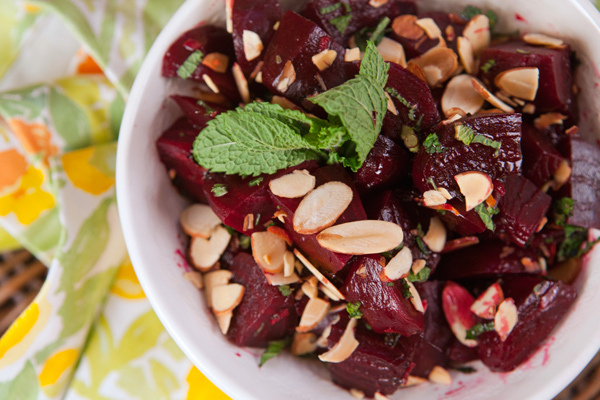 I recently decided to try braising beets, and once they were tender I dressed them in a vibrant vinaigrette made with chopped fresh mint, freshly squeezed blood orange juice, and lightly toasted sliced almonds. We thoroughly enjoyed these beets and found that blood orange was a perfect flavor match for earthy sweet beets. Although they are high in sugar, beets are low in calories, high in fiber, and rich in iron. They are also high in folic acid and beta-carotene while their leafy greens are rich in potassium, calcium, and iron. You can buy many varieties of beets these days, although I simply used regular red beets for this recipe. When storing beets, leave only an inch or so of stem attached, and refrigerate the beets and their leafy tops in separate bags. Beet roots can last in the refrigerator for up to a month, although the beet greens should be used up within four days. Place the beets cut side down in a large skillet and add the water and juice. Cover, and cook the beets until fork tender, about 45 minutes. Transfer the beets to a cutting board, and remove the skin with a sharp knife. Cut the beets into bite sized pieces, then return to the skillet. Add the salt, pepper, vinegar, and brown sugar and bring to a boil. Cook until the liquid thickens and turns into a glaze. 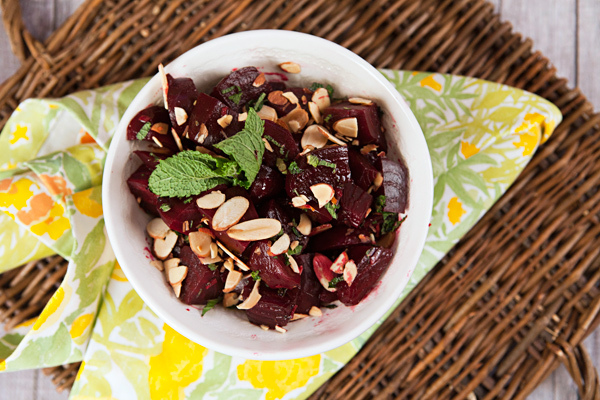 Toss the beets with the chopped mint and almonds and serve warm or at room temperature.